When my mother signed Eva up for a 3 month subscription to Green Kid Crafts for Christmas, I hit the Internet to see if their was a similar program that Wally would like. Wally is not a crafty guy (although he has ended up loving Green Kid Crafts and now is signed up for their sibling kit) and so I wanted a subscription that would be right up his alley. Enter Little Passports. Little Passports is a monthly subscription service where your child follows two characters, Sam and Sophia, on their travel adventures. 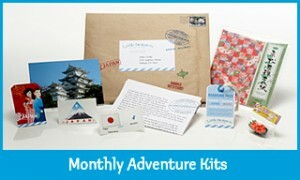 There is an Around the World option for children ages 5-10 and a USA option for children 7-12. Wally is signed up for the Around the World subscription and so looks forward to his package from Sam and Sophia each month. The first month your child receives a cardboard suitcase (to store their goodies), world map, boarding pass (with code for online games), activity sheet and passport. Each month after that Sam and Sophia travel on their magic scooter to a new country and send a letter about what they have seen, a photo, stickers for the passport, suitcase and map, a boarding pass with code for online games about that country, an activity sheet and a souvenir. My mother also bought Wally an Atlas so we have been using it to learn even more about the countries where Sam and Sophia travel. We have learned a lot about so far and this month we are going to try some of the French foods they mentioned in their letter. When I asked Wally his favorite part of Little Passports he said “All of it”. When prodded a little more he said he likes getting mail, likes the souvenir and really likes the online games. We think that Little Passports is a fun and unique gift that is engaging, educational and something that lasts well beyond the day it was given. This review is not being sponsored by ANYONE….I just want to spread the word about this great company and this unique gift opportunity for kids.